Crandle the Hat Maker is a (very) low budget film production concern located in the GTA (Greater Toronto Area), specifically Burlington and Mississauga. Most of the works is done by Carol and Jaramiah (the founders) as well as Carol's sister, Sylvia; along with some help from immediate family and actors hired over the internet. Crandle the Hat Maker was conceived as a way for the founders to combine their love of writing with their love of photography. In short, they had a bunch of short stories and camera equipment lying around; so why not make something of it? Their first production, Tentacle, was filmed in the summer of 2018 and posted online shortly thereafter. Their second, The Last Girl (the first written by Sylvia Son), was filmed in the fall and had it's premiere at the Horror-Rama International Short Film Festival in Toronto in November of 2018. We will keep this information on file and contact you if an appropriate role come up. 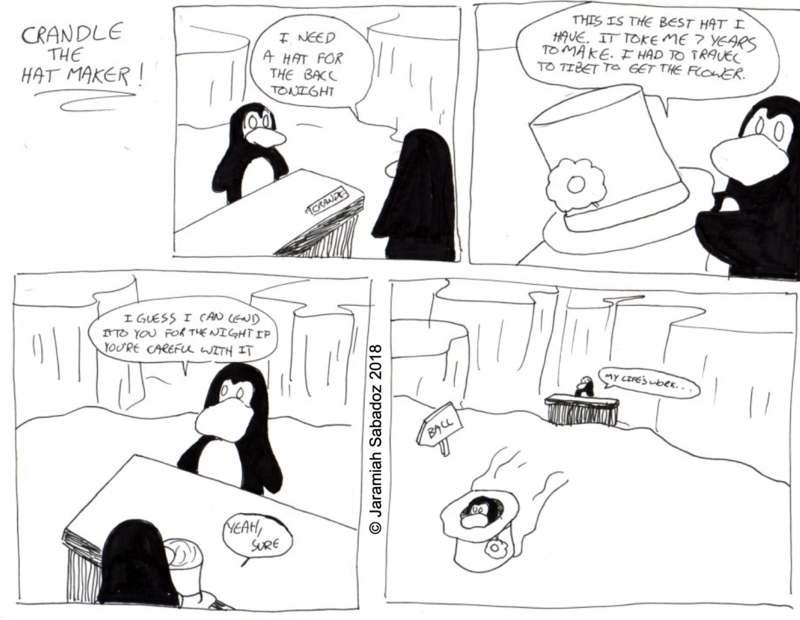 Crandle the Hat Maker, is a reference to a comic strip Jaramiah made in high school, about a penguin that makes hats. This comic strip did not really go anywhere. This was one of several comic strips Jaramiah has attempted; some of which have or will in the future be produced as short films.